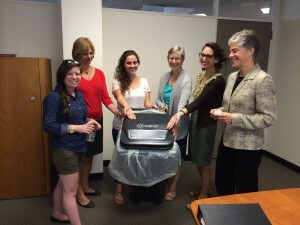 Hebrew Union College-JIR New York’s project was to implement a campus-wide Greening Initiative. The implementation process of project was front heavy. 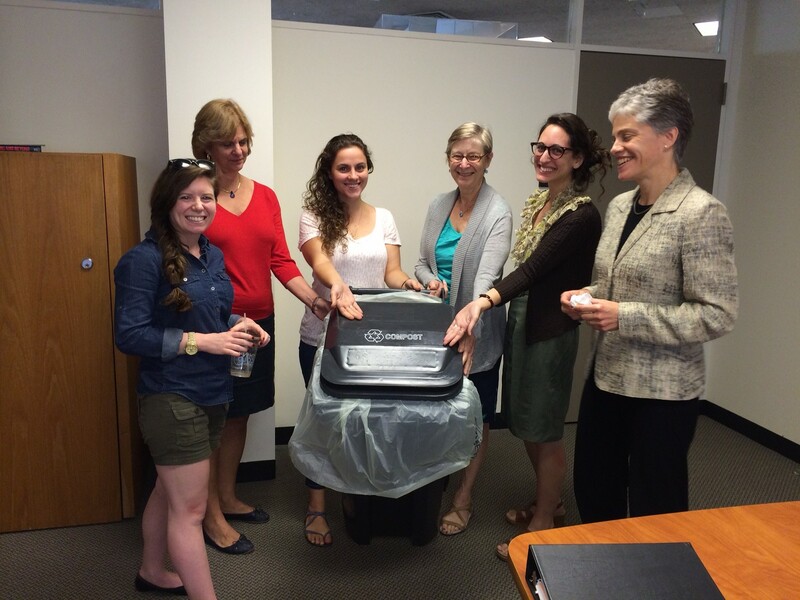 Over the summer of 2014, the student-led Green Team worked with Dean Idelson, a faculty advisor, Director of Operations, Harriet Lewis, and the maintenance staff to identify vendors for industrial compost disposal, pickup, and purchase of compostable plates, napkins, cups and cutlery. After researching several options, the team began a partnership with New York University to piggyback on their already existing industrial compost pickup program. Through this partnership, HUC-JIR NY hired Action Carting as the industrial composting company and set up twice weekly pickups on Mondays and Thursdays. Seven compost bins were leased through Action Carting and were placed throughout the building. The Green Team and the Director of Operations then made the decision to purchase compostable plates, napkins, cups, cutlery, and waste bags from Imperial Paper Company and Green Paper Products. These were vendors that HUC-JIR NY had used in the past for non-compostable items, so the orders were changed to begin purchasing only compostable items. In order to encourage proper use of the new compost system, there were several efforts on campus to educate students, faculty, and staff. 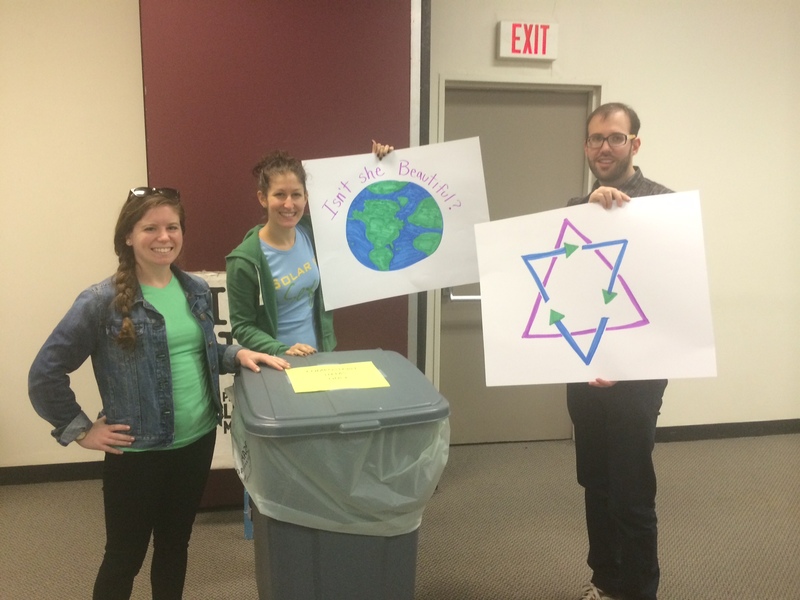 In order to bring about a campus culture change, the Green Team implemented a new centralized waste system. All trashcans were removed from classrooms before the start of the year and were replaced by waste stations on the fifth floor and conference level—the two main hubs for student learning and life. These waste stations included four separate containers for compost, paper recycling, plastic recycling, and trash. In place of the trash bins that were formerly in each classroom, the Green Team hung signs indicating that all waste should be taken to the central waste station. Signage included a Jewish text promoting the values of l’ovdah u’lshomrah, to till and tend the world God has given us, and of bal taschit, the prohibition against wastefulness. A waste station was also placed in the kitchen of the fourth floor, which is a staff floor. Signage in this station indicated what types of items should go in each bin. The secondary major education effort was through two separate orientation sessions with the Dean, Green Team, the Director of Operations, and the Maintenance Director. Both sessions took place in September 2014, and the goal was to explain why the campus was making this shift, how to properly discard waste, and how to promote campus-wide awareness in reducing our environmental impact. The first session was a required session for students and faculty. The second was a required orientation for staff. Both proved successful in meeting their goals. The final education piece was the Rabbi Everett Gendler Environmental Education Series. The first speaker was Rabbi Fred Dobb, who spoke in the rooftop Sukkah on October 14, 2014, with students. Rabbi Dobb, one of the leading rabbis in the Jewish environmental movement, shared text study, an exploration of Sukkot and shmita (the sabbatical year in the seven-year agricultural cycle), web resources, and best practices in synagogue and Jewish communal environmental efforts. A second speaker was originally planned for spring 2015, but due to scheduling conflicts, was rescheduled for the fall of 2015. There have been a number of relevant changes on campus that have also been put into place as a result of the HUC-JIR New York Greening Initiative. First, the weekly soup kitchen that operates on campus started to only use compostable items. This soup kitchen has also been influential in the wider community in teaching about waste disposal. Although it is student-run, it has a team of people who volunteer each week to help cook and serve, including many congregational high school groups and law students from New York University. The discussions about using compostable items have encouraged many individuals to be mindful in their own waste disposal practices. In addition, the Director of Operations has now put into place a policy that any individuals or organizations that rent space on campus must use compostable items. There has also been a campus-wide shift regarding how energy is used as a result of this project. In October 2014, the Director of Operations attended a conference dedicated to ways organizations can reduce their environmental footprint, and she credits her interest in attending to the HUC-JIR New York Greening Initiative. Already she has implemented some of the items she learned at this conference, including installing new, low-water use flushometers on the toilets, changing to LED lighting, and making improvements to the HVAC. She hopes to engage a consultant in the future to do a survey of the building to help identify other ways in which greening improvements may be made. All of these things point to a true cultural shift on campus in how they can reduce their organizational environmental impact.